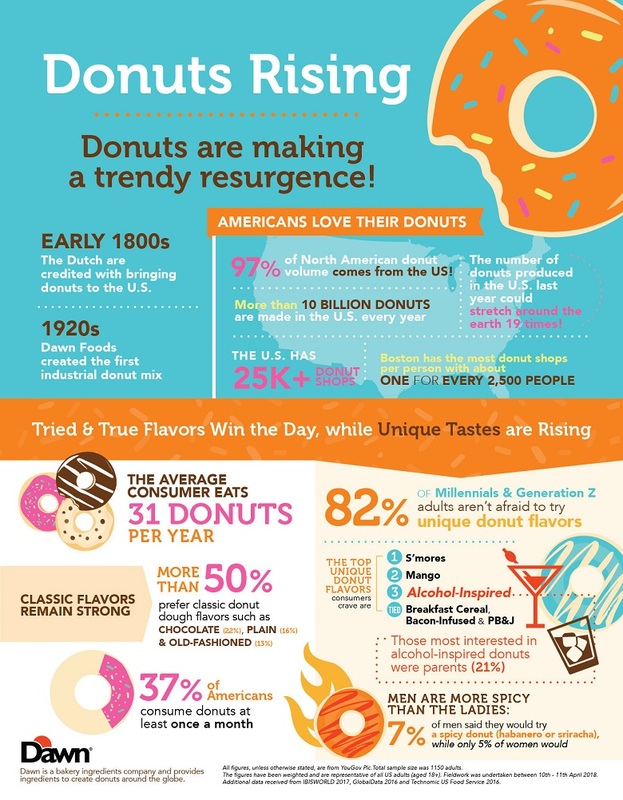 Bakery ingredient supplier Dawn Foods has released finding for its inaugural Donut Day survey, which tracked flavor trends and behaviors among millennials and Gen Zers. Conducted online between April 10-11, 2018, roughly 1,150 U.S. adults took the survey to weigh in on their preferences. The survey found that 82% of Millennials and Gen Zers are willing to try adventurous flavors, including pickle, sriracha and s’more donuts. Among the top flavors included s’mores (29%), mango (18%), alcohol-inspired (17%) and breakfast cereal, bacon-infused and peanut butter and jelly (16%). Of Millennials and Gen Z consumers, 37% eat donuts at least once a month. Parents are the most interested in trying alcohol-inspired donuts at 21%. Consumers in western U.S. are more willing to try adventurous donut flavors. Of them, 72% said that they would try a bold flavor. Classic flavors still remain strong. Over 50% of people surveyed said that they prefer classic donut flavors like chocolate, plain or old fashioned. "As the popularity of this sweet treat continues to grow, our team continues to help our customers deliver the ingredients, inspiration and innovation needed to satisfy this demand," said Angie Goldberg, chief marketing officer at Dawn Foods.